Nuju was a matoran from Ko-Metru, before he was given a toa stone by Toa Lhikan. Nuju, along with 5 other matoran discovered that they were destined to become the Toa Metru. As a Toa, Nuju weilds two Crystal Spikes and wears the Kanohi Matatu, the Great Mask of Telekinesis. This is a description taken from LEGO.com. Please do not modify it. 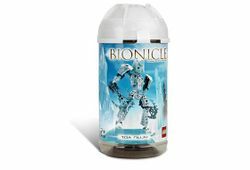 (see an archive of the product's page) Ice-cold guardian of Metru Nui! Cold and aloof Toa Metru of ice and guardian of Ko-Metru, Nuju carries two crystal spikes for climbing the Knowledge Towers and wears the Great Mask of Telekinesis. Nuju can be combined with Whenua and Nokama to make a Kraawa. Facts about "8606 Toa Nuju"
Ice-cold guardian of Metru Nui!